You’ve planned and anticipated for months, and now it’s finally arrived: your Las Vegas vacation! You’ve likely planned everything extensively, from your accommodations to your choice of Las Vegas car service for getting around, to what you plan to see and do. However, there’s no harm in being a little flexible about your plans, especially if you have money to burn and are looking for an amazing experience to invest in. Luckily for you, we’re here to help you make the most of your Las Vegas trip—in more ways than one! 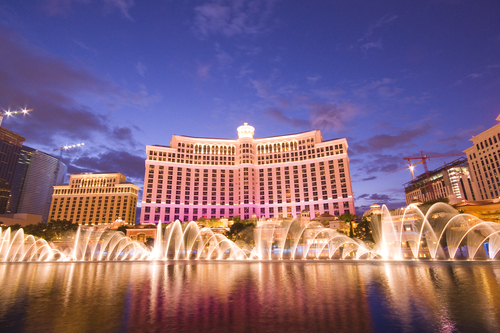 In this blog, we’ll cover some of the most expensive and luxurious things to do in Sin City. For a mere sum of $250,000, you can have the Bellagio Fountains perform in your honor—and we don’t mean hiring an a capella group to cover your most beloved hits! Rather, you have the option of “hiring” the fountain to put on a show for you late at night, once its lights have gone dark. Upon paying the fee, you’ll be presented with an electronic box filled with a simple activation button and a song list for you to choose from. All that’s left is to choose just the right song. Pressing the button brings the fountain back to life—all thousands of its apparatuses—with a song and a show. Once it commences, you can simply sit back with champagne, watch and enjoy. This particular attraction is located at the renowned Bellagio hotel in Las Vegas, already known for its extravagance and dedication to its clientele. If you have an exorbitant amount of money scorching a hole in your pockets, this could be a satisfying way to spend it. With a payment of $3,400, you can have a taste of some of the world’s finest whiskey. How? Ask the chauffeur of your Las Vegas limo to take you to the Cosmopolitan on the Strip. There you’ll receive a swig’s worth poured into your glass, all from a bottle of Balvenie, costing $30,000 in full and around the age of today’s average Baby Boomer. You can sip while taking advantage of the gambling scene in the Cosmopolitan’s Talon Club, if you’d like to spend a bit more extra cash. What’s so special about Palms Casino? For starters, its rooms go for a nightly rate of $25,000 maximum. The thing that makes Palms Casino’s accommodations unique are the themes it allocates to its rooms, which include the likes of Barbie’s famous mansion, a basketball-themed room large enough to house a court for you to play to your heart’s content and much more. Does this sound too good to be true? Use our Las Vegas limo services to ride over to the resort and witness for yourself! No matter what you decide to do during your Vegas trip, we’ll make sure you arrive in style! Get in touch with us to help arrange the luxurious vacation you deserve. Your big Vegas vacation is almost here, and you believe you’re fully prepared for it. Your hotel is booked, you’ve registered with a premier Las Vegas car service and all that’s left is filling up your days with lots of exciting things to do. After all, there’s much more to Vegas than gambling, and you want to experience the full body of what the city has to offer! Beyond the casinos, bars and partying, Las Vegas is a hotbed for entertainment. To help you plan the best possible vacation, allow us to fill you in on the absolute greatest shows available this year. This particular show is perfect for any and all magic lovers out there! Found at Tropicana Las Vegas, Jan Rouven: Illusions features amazing feats you won’t be able to find anywhere else in the city. Named for the show runner himself, Illusions features Jan Rouven immersing himself in one dangerous situation after another, only to come out unscathed in ways that you have to see to believe. Make this show part of your Las Vegas limousine service trip and be prepared for an energetic and exhilarating experience unlike any other! Named after the La Reve Theater, the La Reve show is filled with acrobatic performers creating artfully stunning performances before your very eyes. It’s suitable for all ages, so you can take your children if you’re looking for an entertaining family activity. What’s the difference between this show and others of its kind, like Cirque du Soleil? For starters, La Reve’s setting is wholly unpredictable, even within the venue. You’ll be able to witness the performers working their magic all across the stage, within the audience—perhaps even right next to your seat—and even underwater. Is it really an article about Las Vegas shows if there are no impersonators included? While the concept may sound stereotypical, VEGAS! The Show is anything but. Housed by the Saxe Theater, you’ll find the show is just as educational as it is entertaining as it sweeps through Las Vegas’s foundational timeline. You’ll be exposed to some of the country’s greatest musicians all over again, like the most well-made biopic come to life! Speaking of impersonations, Terry Fator serves as yet another brilliant example—and much more. Part impressionist, part ventriloquist, people of all ages will enjoy what Fator has to offer on-stage. Vocal work will prove to be Fator’s main forte, as he’s not only capable of ventriloquy and impressions, but singing as well. If you’re looking for a different variety of entertainment, why not give Terry Fator a try? You can rely on a luxury limo in Las Vegas no matter what you’re looking to see and do there! Contact us to learn how we can help optimize your stay in Vegas with style and convenience. When you think of vacationing in Las Vegas, what first comes to mind? Sure, there are the casinos and amazing live shows, but there are also loads of parties and—best of all—the bars! If you’re part of the more luxurious crowd, you’ll want only the best place for a night of drinking and fun. 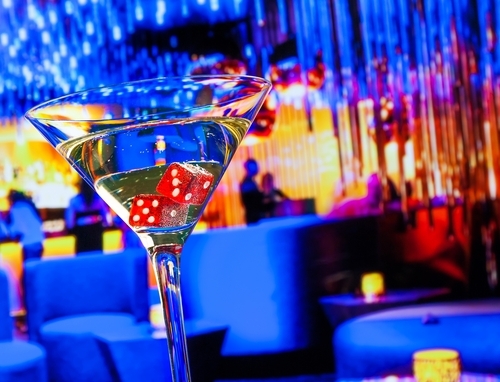 Here are some of the finest and most unique bars available on the strip. If you’re looking to make a place filled with character part of your stops using Las Vegas transportation, you’ll want to consider the Peppermill Fireside Lounge. It boasts full 24-hour service, a restaurant with a complete menu (if you’d like a great meal to compliment the booze) and a fire pit to sit near for a nice and cozy touch. You could stay here as long as you want, chatting up other bar goers and partaking in the game, the fire pit and food and drink, all in an atmosphere you can’t find anywhere else in Vegas! Much like the namesake chandeliers dangling and dazzling overhead, The Chandelier is one of the most extravagant places to visit in Las Vegas—at least in the realm of bars! There’s a little bit of something for everyone here. The whole facility is made up of three floors, each possessing their own unique attractions. The top floor features shopping and a lounge for resting your feet once you’re done drinking, dining and shopping. The second floor is entirely private and outfitted with mixologists to make drinks for you on request. The bottom floor functions as a bar and casino where you can enjoy live performances. You might want to make Park on Fremont part of your Las Vegas trip if you’re a fan of the occult and creepy. Imagine: You hire a limousine service in Las Vegas to take you here, shuffle inside and find a bar that much more closely resembles a decrepit library from an old English manor. Taxidermy and unsettling artwork line the walls, and even the bartenders serving you seem a bit on the disconcerting side. While the decor is nothing like what you’d find in the average bar, the accommodations are spacious and the setting an experience unlike anywhere else! Much like Park on Fremont, Commonwealth resembles a storyteller’s fantasy come true. The interior is vast but comfortable, like the private space of a wealthy baron, filled with crystalline chandeliers, dark wood accents and bartenders able to whip up the best concoctions you’ll ever taste in your life. Stay long enough and you may encounter a few surprises. The top floor houses more seating space, live DJing and another bar. What’s even better is the view! Commonwealth rests right near Fremont Street, enabling you to gaze upon the area and all its nooks and crannies below. No matter where you’re headed, we hope you’ll rely on luxury vehicles in Las Vegas to get you where you need to go! Contact us to learn more about our services and how we can make your vacation the best it can be. Can you truly consider any trip you’ve made a good one if you don’t bring back a souvenir? We doubt it—and we can’t think of a better vacation spot to spend the day shopping than Vegas! When you have lots of money to spend, you don’t want to just go anywhere. This is why we’ve compiled a list of some of the hottest places to spend your Vegas shopping trip! Located on the city’s main boulevard, Via Bellagio has built a reputation as the top shop for luxury shoppers looking to burn extra cash on only the highest quality merchandise. Fashion lovers will rejoice as they step foot into the mall’s shining halls, flanked by the likes of Fendi, Armani, Prada, Gucci and so much more. But clothing isn’t all Via Bellagio has to offer! It has its own one-of-a-kind shops, known as the Via Fiore. There you’ll be able to find gorgeous souvenirs to choose from, including precious jewelry, electronics and even fine art. If beauty is one of your main priorities, you won’t want to miss out on making Via Bellagio one of your stops in your Las Vegas limo! Speaking of beauty, Crystals at CityCenter is another aesthetic hotbed for the luxurious shopper. This shopping center is rendered easily recognizable thanks to its chrome exterior, which is etched into a crystalline shape after its namesake. As the outside may suggest, this attraction guarantees much more than just great shopping (if you’re so inclined)! You will not only find top designer brands, but also prime eateries and plenty of cultural venues, including an art gallery. We assure you it will make for a marvelous day on the town! If you’d like a more relaxed day out, Town Square is the perfect place to visit. 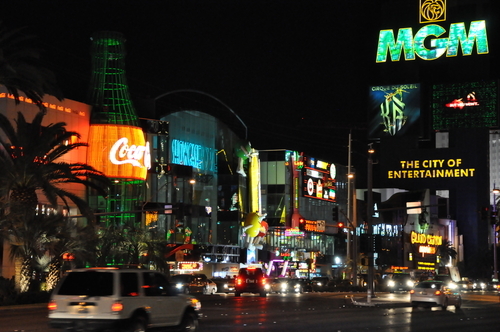 Town Square makes up one big district—the ideal tour location for limo transportation in Las Vegas. Not only are there more than 150 places to shop, but it also features a wide variety of selections that will ensure everyone has a place to visit. There are also many other attractions worth checking out, including restaurants, a cinema and a park for your little ones to play in. Fashion enthusiasts will love Fashion Show and its vast collection of over 250 places to shop, which features the likes of Nordstrom, Saks Fifth Ave and much more. 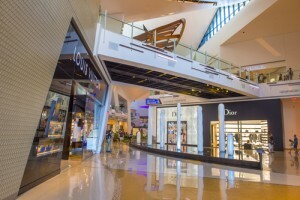 It’s considered not only one of the best places for fashion and apparel in the city of Las Vegas, but one of the largest places to shop in the United States as a whole. Don’t just take our word for it, though; why not come and browse for yourself? Where does such a wishful name come from? For starters, if you visit the Miracle Mile, you’ll find a huge collection of more than 170 shops to visit for anyone young and fashion-oriented! If you’re feeling exceptionally in the mood for a good splurge, you can take advantage of one of Miracle Mile’s four shopping packages, which feature amazing deals on all sorts of attractions designed to grant you an amazing day (or night) out. No matter what (or where) you’re interested in seeing on your Las Vegas trip, you can count on our premier Las Vegas limousine company to get you there safely and in style! Get in touch to learn how we can make your Vegas vacation the best ever! We know Las Vegas may seem like the last place to spend your time tending to business matters. 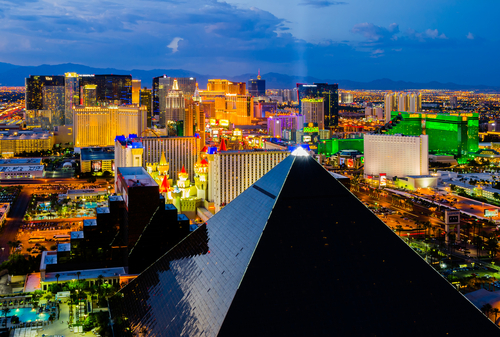 With nicknames like Sin City and its play hard attitude, you likely hesitate at the thought of taking your associates there for a professional trip. However, Las Vegas can be the perfect spot for your business affairs—for several reasons! Let us enlighten you further on how Las Vegas is the ideal spot for VIP executives looking to connect with like-minded company. 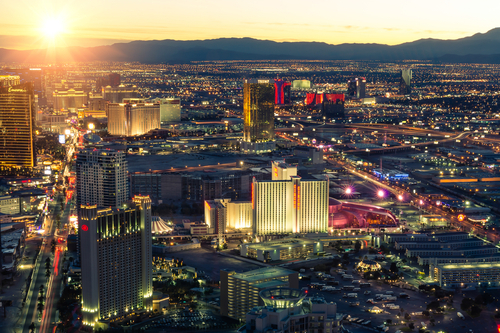 Believe it or not, Las Vegas has a large number of business-related conventions to attend, the majority of them being the best in their respective industries. In fact, Vegas ranks as the absolute best location for trade shows and similar activities. While you’re in Vegas, you’ll have access to the Convention and Visitors Authority, which specializes in making your executive VIP trip the best it can possibly be in the realms of both professionalism and comfort. One of the best things about Las Vegas is it’s a fairly close-knit city. Depending on the accommodations you choose, you’ll be nestled right in the heart of every attraction Vegas has to offer and can merely walk anywhere you need to go on foot. However, it’s just as likely that a high rolling professional may seek out other options. In this case, you can also rely on a Las Vegas chauffeured limousine to get from place to place. We’ll have you and your associates covered no matter where you need to go! You’ll almost never run into scheduling issues if you decide to host your business meeting in Vegas. There are so many venues to choose from that you’ll always be able to pick a convenient time and luxurious meeting place in the city. Once you book the location and time, all that’s left is to wait for your Las Vegas car service to arrive to make sure you get there on time! Another great aspect of Las Vegas is its ability to appeal to almost everyone. Should you hold a business event in the city, you’re guaranteed a high turnout. After all, who can turn down a trip to one of the most alluring cities in the world? Should you hold your meeting here, your attendees are sure to be talking about your event for years! Of course, you can’t set up a VIP executive event in Las Vegas without first hiring an executive limo in Las Vegas to help you get around! Contact us to learn all about our services and how we can help you. There are so many great things about vacationing in Las Vegas. One of the most notable, however, is how you will never run out of things to see and do. If you are a VIP visitor, you’ll only want the best of the best activities! But how can you tell what’s worthwhile? For tips, you can turn to none other than our premier Las Vegas limousine service! We know the city of Vegas like the backs of our hands, and have published this article for the sake of giving you some excellent and classy ideas for activities to partake in while you’re on the strip. Formally known as Drai’s Beach and Nightclub, Drai’s has built a reputation as one of the best possible party spots to visit in Vegas. You can reserve a party prior to your arrival in Las Vegas, at which you’ll be treated like absolute royalty. Picture this: you and your entourage are escorted to the party by either a private jet commissioned by Drai’s or by a luxury limo in Las Vegas. Once you arrive, you’re treated to the most dazzling and brilliant fireworks show erupting above a crowd brimming with all of your choicest friends. Drai’s bar service is beyond compare, with choices including the likes of Don Perignon and Armand de Brignac, which have been personally gifted to you by the club. Once you step into this one of a kind party, you’ll never want to leave! “Why is the Grand Canyon on this list?” you may wonder. It may seem like a mundane choice, but it’s truly about the way you experience the vast canyon than simply going there at all. If you’re up for it, you can rent out the Grand Canyon and enjoy a private tour. With the help of our limo service in Las Vegas, you can easily arrive to the takeoff site of a private jet, which will cruise you around the Grand Canyon and complimentary lunch. You’ll be able to experience the canyon in ways like no other! While there’s only a handful of people who come to Vegas and don’t play poker gamble in Vegas, it is again all about the experience. Should you come to the Bellagio, you’ll be able to enjoy a 100 percent private game with an astronomically large pot to enjoy. There, you’ll truly be able to play with the biggest of the big shots and partake in a fine afternoon of high stakes fun! Of course, these aren’t the only things you can do while you’re visiting Las Vegas! Contact us to learn all about your other options, as well as some equally luxurious ways to get around.